This quote has always stuck with me. I want my students to be risk-takers, readers, writers, and learners. If I want those traits in my students, I need to make sure I challenge myself to embrace them. This blog is that. My thoughts, opinions, reflections, and stories as an elementary principal, dad, husband, and learner. ​It’s 5:00 p.m. on a warm July night; the middle of summer vacation. 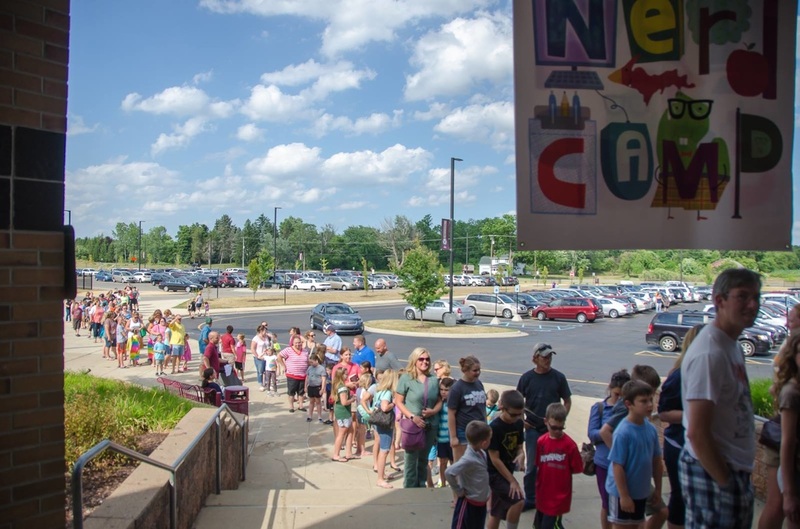 A long, winding line of excited kids extends out the concourse and around the building. They are not here for a Detroit Tiger baseball game or a Taylor Swift concert. The 750 strong are here for Nerd Camp Jr. This reading and writing camp for kids has become a must attend event for my family each summer. The event starts with a Pictionary-style draw off. The competition is as intense as the star power. Where else can you see Raina Telgemeier and Jenni Holm go head-to-head with 750 kids cheering them on? Everyone is having a blast. The atmosphere feels more like a rock concert than a reading camp. After the draw off, the kids head to sessions with authors and illustrators. Each child spends 30 minutes with three different authors and/or illustrators. The kids also have a pizza dinner and receive books for attending. Amazingly, the entire camp is free! Pizza, free. Expert author mentorship, free. Books, free. Autographs at the end of the night, free. The entire event is covered by donations and generous sponsors (listed at the end of the post). The authors and illustrators all volunteer their precious time and talent. They receive no speaker fees or travel expenses. They want to support literacy and believe in the Nerdy Community. The Nerd Community is a group of book-lovers that support each other. The group is made up of students, teachers, principals, librarians, authors, illustrators, and anyone else who loves books. They community shares ideas on the Nerdy Book Club blog, collaborates on Twitter, learns from each other at Nerd Camp, and supports literacy opportunities for kids like Nerd Camp Jr.
At the end of camp, Colby Sharp (Nerd Camp Jr. creator) surprised the campers with three huge tables of free books. Each camper left the camp with at least three new books. I was working the free book table and could tell you the excitement was unmatched! My son, Evan, was all smiles. He met his two favorite authors, Raina Telegmeier and Debbi Ohi. He begged us to buy another copy of Lady Pancake and Sir French Toast, by Josh Funk, because “he is the coolest person in the world.” He spent the next day reading the books (discovered a new series he loves, Cody by Tricia Springstubb) and drawing blob fish (because Jess Keating has “the best autograph”). I am thankful for Colby Sharp and the countless volunteers that make Nerd Camp Jr. possible. Thank you to the authors and illustrators that volunteer their time for this event. 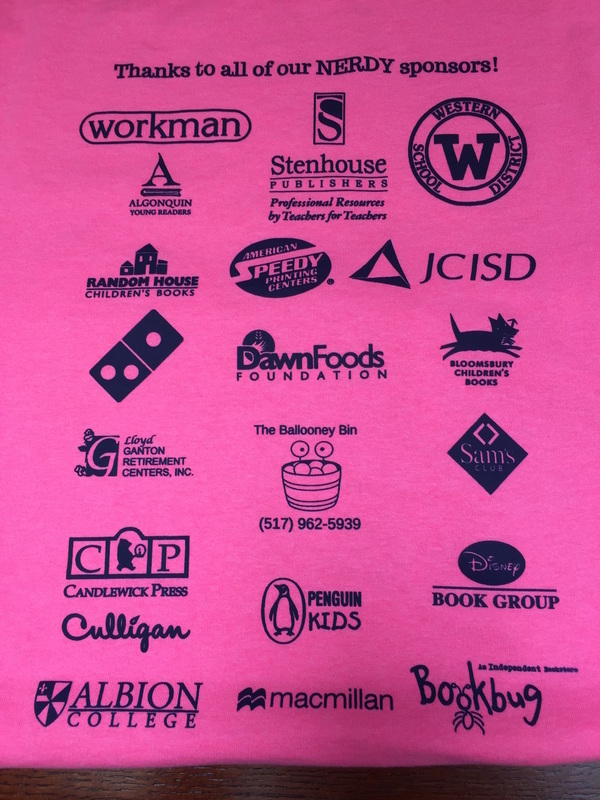 Finally, many thanks to the sponsors and people that donate to support Nerd Camp Jr.
Reading friends and families from Saginaw, I highly suggest you consider having your child participate in Nerd Camp Jr. next year. It is well worth the 100 minute drive. This is the type of event that creates lifelong readers and writers. Way to go, Team Nerdy! Anyone old enough to have been alive on September 11th, 2001 can tell you exactly where he or she was when they learned America was under attack. I had just finished my math teaching methods class at Saginaw Valley State University. Dr. Cline arrived to teach methods of teaching science just like every other Tuesday and Thursday that semester. He wasn't his normal, jovial self. A sadness covered his face. He told us that a plane had crashed into the World Trade Center. A lot of people were dead. Gasps, head-shakes, and quiet reflection filled the room. After taking a minute to process, we started our learning about science from Dr. Cline. Later Mrs. Hillman, our math teacher, returned. Red-eyed, openly crying she told us America was under attack. A second plane had hit the World Trade Center. She didn't know if it was over or if it was just the beginning. Class was dismissed. I headed to Hemmeter Elementary, where I was the director of childcare. It was the closest place I could think of that had a television. To this day, this was the only time I have ever seen the tv turned on in the teachers’ lounge during the day. The entire staff was gathered watching in disbelief. How could this happen? How could there be this much hate in the world? I remember years later feeling frustrated with my students when I felt that they didn't give September 11th the “proper respect” it deserved. They weren't disrespectful. The day just didn’t have the same meaning because they hadn't lived through it. In truth, most of them were too young to remember the actual day. The students who are currently enrolled at my school weren’t even alive on September 11th, 2001. I believe that well-written books are one of the best ways to revisit historical events with our students. 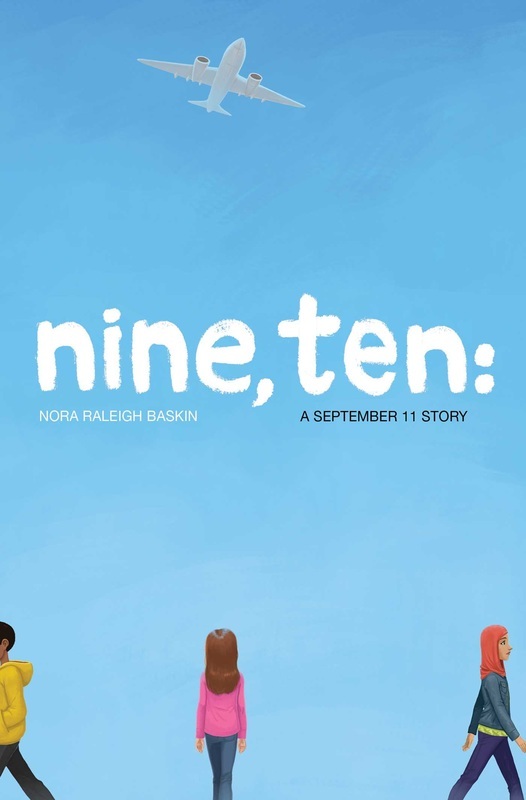 That’s why I was so excited to read Nine, Ten: A September 11 Story, by Nora Raleigh Baskin. September 11th is a touchy subject in the middle grades. Although you want the students to understand the significance of the topic, you don’t want them to feel unsafe. Nora’s story perfectly blends the two. Nine, Ten tells the story of four very different characters whose lives are dramatically affected by the events of September 11. The majority of the story takes place between September 9 and September 11. The characters are rich and relatable. My favorite character is Naheed, a young Muslim American girl. I work in a school with many Muslim families. They are peaceful, caring, generous, and fantastic people. They share absolutely nothing in common with the extremists you see on tv. I really enjoyed seeing Naveed’s internal struggle as she transitions into middle school. Naveed is proud of her religious beliefs but struggles with the staring teenagers and whispering stereotypes. Wearing her hijab starts as a point of pride but then transforms into a self-conscious object. Ultimately, her growth and interaction with other characters show us what is great about America. Although we are not a perfect country, we still strive to be better. Most Americans recognize we come in all shapes, sizes, religious backgrounds, and races. Don’t let the vocal, xenophobic minority make you think otherwise. Big ideas abound in this story. They lead to relatable characters and numerous teachable moments. A few of my favorite “big idea” topics in the story include: grieving for a lost parent, bullying based on stereotypes, parents that don’t have their child’s best interest at heart, mentorship, overworked parents, and of course, dealing with one of the biggest tragedies in the history of our country. The story runs the gamut of emotion. Obviously, it is serious and sad at times. However, it also has many light moments. My favorites include the old school professional wrestling reenactments between Will and his friends and family. I loved professional wrestling as a kid so it was fun to reminisce about flying elbows from Randy Savage and pile drivers from Jerry Lawler. Nora does a great job blending the seriousness of September 11th with the lives of rich characters. In the end, the thing I love most about this book is that it gives teachers an informative, appropriate way to share the events of September 11th with their students. Nora captures the seriousness of September 11th while still leaving readers with a message of hope. The characters are all affected by the events of September 11th, but none experience terrifying fear or tremendous loss. They live through and wrestle with the emotions of the day, but witness true bravery or heroism. The story concludes with Americans of all backgrounds standing together remembering those lost and honoring the heroes that put their lives at risk to try to save others. ​School has been out for a little over a week. Contrary to popular belief, summer isn’t one long vacation for educators. This is time we spend learning at professional development, reading about the latest teaching strategies, and collaborating together. I sit in the conference room at Biggby with a fresh cup of Butter Bear coffee in my hand waiting for one of my favorite summer learning activities to begin. Each year the staff votes for the professional book we want to read over the summer. We then meet once a week to discuss the book and how we will implement the ideas into our school. I love these meetings. They always start with conversations about the book, but so much more takes place during this time. Inevitably, the conversation moves away from the book and into other ideas for the school. This is the part I really love. I don’t know if it is the calm of summer or the recharged batteries, but ideas always flow better at these “book club” meetings. We don’t have lesson plans to finish or committee meetings to attend. It’s just a cup of coffee and the most dedicated educators trying to solve the world’s problems. No one leads the discussion, no one keeps time, and no one takes minutes. Everyone contributes and usually leaves with a multi item to do list. The conversation starts with “Buddy Benches.” A Buddy Bench is a spot on the playground where students can go if they don’t have a buddy to play with at recess. Students simply sit on the bench and wait for other students to come and invite them to play. We talk about how we want to build the bench. We settle on having the students paint the bench with thumbprints. We brainstorm how we will introduce the bench to students. Next, the conversation moves to reading. We love the progress we have made in this area. Our school is truly a community of readers. We have book doors, author visits, and huge school and classroom libraries. Almost the entire staff attends Nerd Camp and the Michigan Reading Association annual conference. Our students, parents, and staff value reading. While our NWEA and M-STEP reading scores are some of the highest in the state, they still fall behind our high expectations. We talk about giving the students more opportunities to reflect on their reading, spend more time conferring and annotating authentic text. We also agree that we need to research the types of tasks students are asked to complete on the state assessment. There is a disconnect somewhere between the taught and assessed curriculum. This discussion leads to a conversation about how to handle curriculum night next year. For the past two years, we have held an open house and hosted a math night. We adopted a Singapore math curriculum two years ago and spent a lot of time explaining the philosophy to parents. We used curriculum night to focus almost exclusively on math. However, everyone agreed it was time to alter the plan. Parents were comfortable with the math program and students have shown great improvement in math. We agreed curriculum night should change its format to give equal emphasis to the other subjects. We kicked around different formats and dates/times. It is almost time for our session to end. I see a couple of teachers are smiling sheepishly. They have the come-on-who-is-going-to-ask-the-question-we-are-all-wondering-about-look on their face. Without missing a beat, Nicol asks, “So have any decisions been made about the open teaching spot?” I love the openness of our school. No one is afraid to ask a question or suggest an idea. I am not the boss. It’s just not how we run things. We collaborate on every decision. Everyone has a voice. Everyone supports each other. That’s what I love most about book club. It’s a time for the staff to get together and plan for the future. It’s a time to collaborate. It’s a time to be inspired by each other. I sit back and smile before answering Nicol’s question. I think about how much I love the teachers around this table. I think about how they spend their summer reading, learning, and collaborating to give our students that best education possible. I think about how lucky I am to be at Hemmeter. I would never dream of hiring a teacher without their input and approval. “We are putting together a team of teachers to help pick the person next week,” I reply. Everyone leaves but I sit back for a few minutes. I enjoy the last few drops of the sweet, sweet Butter Bear. It’s an amazing group of teachers. I push in my chair already thinking about the logistics of building the buddy bench. I grabbed my new blue notebook, 2 pens (BIC Mark-It and uni-ball Signo), my “Life is Good” coffee mug, and headed out the front door to count 100 steps. I’ll admit, I didn’t expect to notice much. I thought 100 steps is too few, the area is too familiar. I was wrong. I found myself staring at the neighbor's front yard for the first time. I see it every day, but never like this. The first time I saw it was two years ago when we moved in. An African-American man no older than 60 was riding his John Deere lawn mower. He smiled and tipped his cap. I would see him just about every day for the next year. I would see him cutting the grass. I would see him trimming the hedges. I would see him edging the driveway. Then one day, I didn’t see him. I saw a hearse, hugging family members, and a black veiled wife crying on the porch. That day I hugged my wife extra long and kissed her an extra time. A sad reminder that life is short and time is precious. I hadn't thought about the man much until today, sitting with my notebook, pens, and a cup of coffee. I stared at the huge oak tree in the front yard. It has been there much longer than both me or the deceased man. It is tall and strong at first glance, but time is catching up with it as well. A third of the tree no longer produces leaves. Dead limbs can be found in all directions. One branch is completely broken off. The other branches are holding it in the air like they are begging for just one more day with their friend. One strong wind and he will be gone. Another branch lays on the ground like the seven others that are peppered around the tree. Even the birds seem to avoid the tree. I can hear chirps all around me, but not a single bird sits upon the oak. Upon closer inspection, the yard is full of signs that the caretaker is gone. Another dead tree stands next to the elm. Far too young to be dead, but an untreated fungus has consumed it. A rusted basketball hoop with a cracked backboard and shriveled net barely stand by the front door. A hummingbird feeder swings completely empty from a dilapidated metal pole. The window shades are drawn closed. The same 100 steps as two years ago, but a vastly different view. ​Last year at Nerd Camp, I decided I was going to start blogging. It wasn't an easy decision; I was full of self- doubt. Who would be interested in what I have to share? Can I write well enough to write a blog? Do I have the courage to be vulnerable? I wrestled with these questions for almost a year. As I prepare to head back to Nerd Camp, I realize now is the time to start. I am inspired to write by four people that probably don't even know they inspire me: Kate Messner, Jeff Anderson, Colby Sharp, and my wife, Laura. Kate is a fantastic author and is passionate about encouraging teachers to write. She co-leads a summer professional development opportunity for teachers called Teachers Write! I love her advice to writers: write! Jeff Anderson has always been one of my favorite writing mentors. I have used his books in my classroom for years. However, it was an interaction with him at MRA that inspired me to start writing. During a session at the Michigan Reading Association Conference, he had all the participants writing. I volunteered to share my writing during the session. After the session, Jeff approached me and said, "You have to start writing. If you don't, I am going to steal some of your lines." He probably has no idea how that brief interaction gave me the final boost of confidence I needed to finally start blogging. Colby Sharp is one of the people that inspires me the most. He is absolutely fearless. From Nerdy Book Club, to Nerd Camp, to the Yarn, Colby follows his passions and isn't afraid to try new things. Colby said something during a conference that has stuck with me: ‘Tell your story. If you don't, who will.’ Thank you, Colby. This blog is me telling my story. Finally, I would never have the courage to start blogging if it wasn't for my wife. She is my constant source of encouragement and inspiration. She won't let me take the easy way out of anything. Every time I try to make an excuse for why I shouldn't start writing, she challenges me to quit making excuses. I love you for seeing a better me than I see in the mirror. 350 days since I decided to start blogging at Nerd Camp, I am about to post my first blog. I look forward to sharing my life as an elementary principal with the world (or maybe only myself). Who knows, but writers write as Esme Raji Codell reminds us in Sahara Special, and I am a writer. ​Four years ago I was ready to leave education. I loved my school, I loved my principal, I loved my colleagues, and most of all I loved my students. Unfortunately, I was infected with a GERM, as Pasi Sahlberg calls it, the Global Education Reform Movement. The obsession with high stakes testing, lack of autonomy in the classroom, and general standardization of education was forcing me to reevaluate my career path. I was most affected by this GERM in the area of teaching reading, if you could even call what I was doing teaching reading. It would have been better titled, “Accelerated Reader time,” or “Over teaching a novel class,” or “Everyone read the same boring excerpt and complete workbook pages period.” Whatever it was, it definitely was not reading. Luckily, several people in my life had also been infected with this GERM and they knew the cure. They had just the prescription:The Book Whisperer by Donalyn Miller, The Reading Zone by Nancie Atwell, beginning my professional journey on Twitter, and engaging with a small group of passionate colleagues that were ready to help me fight this disease. Four Years Ago: Full Infection Five years ago my school was completely infected with the GERM. Independent reading completely revolved around Accelerated Reader (AR). My students did not read for pleasure, they read for points. If the book wasn’t on AR, they didn’t read it. Students were not talking about their reading or discussing big ideas. They were storing just enough information about the book to get 10 out of 10 on the low-level quiz. Get enough low-level questions right and you might get that can of pop or get to pick a dollar store prize from the AR store. If you happen to be short a couple of points, no problem. Just quickly read a few Clifford books. They are worth .5 points each. You could easily get those last two points before the period ends. Who cares if you hate Clifford, you will get your goal! Whole group and guided reading time wasn’t any better. The district had just adopted a brand new basal series. My student workbooks arrived over the summer; 451 pages of worksheets. It was bigger than our local phonebook. There were even hundreds of additional pages you could print online. I wanted to scream, I wanted to shout, I wanted to rip all 451 pages out of the workbooks. But more than anything, I wanted to find a cure. Three Years Ago: Starting Treatment Recovery started with two books, The Book Whisperer by Donalyn Miller and The Reading Zone by Nancie Atwell. I loved them. It may sound dramatic, but these books changed my life. I have no doubt I would have left education if I hadn’t found those books at that time. I read each book multiple times. I was determined to build a community of readers. I wanted to build real readers who read not for points but for pleasure. Although I was still required to do AR in my room, I completely deemphasized it. We traded in our AR point goal for the 40-book challenge. No more low-level tests to prove you read the book. Instead, we were going to talk about the books during reading conferences. Anyone can fake it on a book report but it’s hard to fake a reading conference. If you didn’t read the book, it was obvious during the conference. However, it was really a non-issue because when my students were given the freedom to read for pleasure, they didn’t need to be held accountable. They wanted to read the books so they could talk about the books with other readers. Our classroom was slowly transforming into a reading community. We implemented daily book commercials and kept ‘someday’ lists to read. Students developed reading plans. It was not uncommon for a student to list the next ten books they were planning to read. My fifth graders were reading independently every day for 40 minutes and begging for more time. Although my students loved independent reading time, they also loved the minilessons and guided reading sessions. We traded in the 451 page workbook for reading notebooks. The basal reader was replaced by SCOPE magazine, high interest articles from the internet, and other trade books. We adopted Kelly Gallagher’s article of the week idea. Read aloud time was sacred in the room. 20 minutes every day, no matter what. It was a reading utopia, and it was working! Several students jumped 2 or 3 grade levels on the annual reading assessment. Students told me they read more this year than all the other years of their life combined. My 32 students read over 1000 books that year. It was my best year as a classroom teacher. It also turned out to be my last. That summer I was hired as the principal of the building I had been a teacher at for the previous eleven years. Two Years Ago: The Road to Recovery Before I learned about the Nerdy Book Club, I had a group of like-minded colleagues that I called my reading peeps. We were a team that shared a passion for creating lifelong readers. We supported each other in building classrooms that valued independent reading and strived to create a community of readers. We saw that this approach was benefitting our students and wanted to share our learning with other teachers. We hosted book clubs using The Book Whisperer, The Read Aloud Handbook, and The Reading Zone. We joined Twitter and found other teachers just like us all around the world. My peeps and I participated in Twitter chats and attended camps. In addition, of course, we found the Nerdy Book Club, a never ending source of encouragement and professional development. As a team, we were able to defeat the evil GERM that was affecting our school. Present Day: The Model of Health Aaron Zenz author visit Today our school is a model of reading health. AR is gone. Some teachers were reluctant to give it up at first. They were not sure if they could hold students accountable without the tool. However, they quickly learned that reading conferences served as a far better tool. Also, you should have seen the smiles on the teachers’ faces at the first professional development when I handed each teacher a gift card to Barnes and Noble and ordered them to go now and fill their classroom library with books. The gift cards were loaded with all the money we saved from not purchasing AR. Everything we do now is centered around building lifelong readers. We have book doors on every door in the school and our locker tags share what students and staff are reading. We frequently invite authors into the building for author visits. I am convinced there is no better way to motivate students to read and write than to have authors visit your school. We celebrate them like the rock stars they are. Our custodian, Mr. Dan, getting in his 20 minutes Every single student and staff member in the building reads for 20 minutes a day. We even have comfy chairs set up in front of the office to model the practice. We invite parents and central office officials to come in and read or serve as guest readers. I visit classrooms throughout the year to do book commercials. A principal or teacher book talk is very powerful! The book immediately becomes a must read in the classroom. I did a book commercial on Amulet earlier this year and all 29 students have now read the book. This is a picture of students interested in reading Jess Keating’s How to Outrun a Crocodile with your Shoes Untied after my book talk. Even our community service project is centered on reading. The kids are collecting new or like new books to donate to high poverty schools in our area. Even my coffee mug promotes our goal of creating lifelong readers. Even as we are a picture of reading health, we understand the importance of preventative care. We continue to collaborate with like-minded colleagues, participate in Twitter chats, attend conferences, and learn from each other in order to remain a healthy reading school. ​Jim Bailey is the principal at Hemmeter Elementary in Saginaw, Michigan. He has a passion for helping all students become lifelong readers. Jim spends his time reading, cheering on the Detroit Tigers, and enjoying time with his family (wife, Laura, and two sons, Evan and Griffin). He is an all-around nerd who probably spends too much time obsessing over Game of Thrones, Star Wars, Clash of Clans, and comic books. You can follow him on Twitter @jcbailey3.